I’d started to form a thought that a 4-Play sale might be about the welcome glut of four-player co-op games we’ve had this last half-decade – Left 4 Dead, Rayman, Ghost Recon, Monaco, even Mario – but soon had that misconception buried beneath a shroud of unexpected doominess. It turns out Green Man Gaming have asked their regular bargaineers what game they’d choose to spend their last four hours on Earth with. Battlefield 4, it turns out, and Skyrim, both of which will appear in this weekend’s sales. Evidently still hot on that number, GMG have pledged to run at least four deals every four hours, across the next four days. The first set of deals went live yesterday at 4pm GMT, and have been successively replaced by new games every few hours since. At the time of writing, Super Meat Boy and the Magicka collection are headline acts – buy one of them and you’ll get a free bonus game, The AssKickers, in with the bargain. Soon enough, of course, they’ll be replaced by a new set of deals. And so on and so forth, until the wallets run dry and it’s next week already. 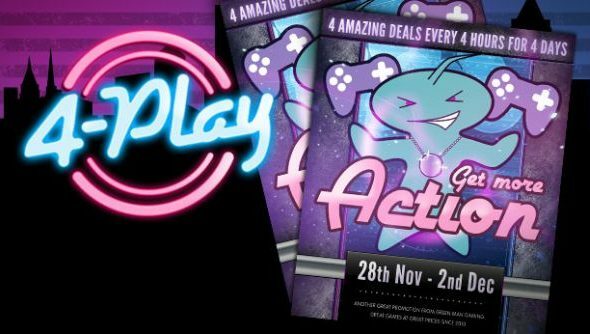 You’ll find vouchers can be applied as a sort of discount multiplier through the sale period – you’ll want to keep an eye on the Green Man Gaming blog to take advantage of those. What’s more, every purchase will see the buyer entered into a competition to win one of four sets of, yes, four games – Call of Duty: Ghosts, Injustice, LEGO Marvel Super Heroes and Batman Arkham Origins. How can we forget? Synchronise watches, everyone. It’s time to stock up for the post-Christmas game binge. What’s on your wishlist?